If anything can drive this Irishman into a fit of cursing, it's the need to create a regular expression quickly. With a little application, I know I could learn to create them myself but I figured some time back that the frequency with which I use them would not equate to the time invested in the study. So, I either have to rely on ones that I have, and can never locate, or turn to a good tool. 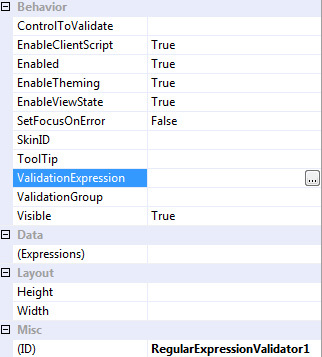 Well, I was reading Professional ASP.NET 3.5 in C# and VB by Scott Hansleman and others recently when I saw mention of a Regular Expression Editor in VS 2008. This was news to me! Then I noticed a regular expression facility in the Find and Replace tool (CTRL-F); how long has that one been around? 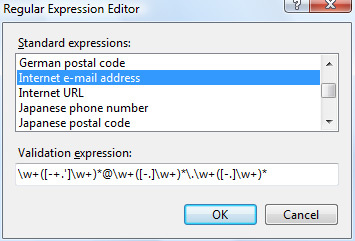 Anyway, it was just what I needed for some basic regex's for email and phone numbers. Granted, it's pretty basic but if you're in a hurry this will save you some Googling time! I wonder is it possible to extend this tool to add in one's own custom regex's for reuse? One more thing: Scott's book is a great reference with over 1600 pages of info. I have only two gripes about it: 1) If you read it in bed you'll need a hoist to avoid the hernia, and 2) The entire book is based on the Web Site template. What were they thinking of? 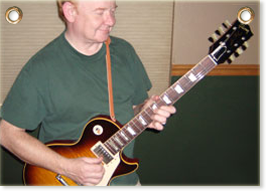 Hey Anthony, I dont use regular expressions much too, so I rely on http://regexlib.com/ for the job, check it out it has all the standard stuff you might need. And by the way this is not my site I just thought you might find it useful. For the love of god, do not validate emails using regexp! The provided example will pass many invalid email, while fail many valid emails. The main thrust of the post is about the tool itself and its use for "general purposes". That said, you make a very valid point and I feel guilty for promoting a lazy approach to data input validation. I think I'll come back to this in another post and outline a better practice! !